Heading off to get married. The original plan was to float down Pine Creek until we found a spot that just hit us. A little chancy but so was the whole proposition. Unfortunately we discovered that there was no water running in Pine Creek at that time of year. Not ones to give up easily we still packed boats - although they went unused. The trip up was beautiful. The Jeep hauled the Airstream perfectly. I even met a seldom seen cousin at a rest stop. What are the chances? Airstream set up at campground. When we came back the following year for our anniversary we stayed at Hills Creek State Park instead. That was much better. No creek running next to it but there was a small lake and a noticeable lack of flakes. Plus I felt better about the water. Maybe because the dumpstation wasn't in an old creek bed and there weren't signs on half the water outlets saying "Non-Potable Water". But back to the tale. Set up went fairly smoothly for a first time. Unfortunately I didn't not have a long enough electric cord and had to borrow one. Apparently a source of great stress for the owners. As I mentioned earlier, Zach was diagnosed with a tumor and wasn't supposed to live more than a month. Almost a year later he was still kicking and we hadn't made any arrangements for him. We didn't want to kennel him - he was sick and what could ruin an elopement faster than the dying dog call? No one we knew was familiar with him and able to care for him so we figured the least stressful thing for him would be to come along. He had a great time. If anything I think it kept him going through the next winter. Unfortunately, one of the campground's big and very important rules is that dogs were never to be left in a camper alone. Even if they liked it and didn't bark the whole time. That limited our choices of where we could go to exchange our vows. We had given up on the boat to a spot plan - fortunately since Zach didn't boat. We read about a waterfall at the bottom of a trail but when we started out down the trail Zach fell down the hill. Some uphill hikers told us it only got steeper and that there was no water in the waterfall anyway. Frustrated and discouraged we started driving down forest roads until we somehow ended up at the Owassee Day Area of the Tioga State Forest. It was literally our last attempt for the day. If this didn't lead anywhere we were going to pack it in and try again tomorrow. We went miles down this until we found our spot. The "parking area". The creek was a couple hundred feet away. We have these guys to thank. The spot was beautiful. After all the stress and up in the airness of our just drive to the PA Grand Canyon and find a spot to exchange vows plan, it felt good to have found the spot. We spent a relaxed evening in the camper. Chloe kicked my rump in 500 Rummy - a feat that would spark an evenly matched multi-year camping tournament. Chloe cooking in the Airstream. We spent the next day exploring the area. What a place. Pine Creek from a bridge near the campground. Intimidating rock overhangs. The place had it all. We were planning to marry the next day but we woke up and it was cloudy and overcast. The next day was 9/11 and even six years later it didn't seem like the best wedding day. So instead we shot for Wednesday, Sept 12, 2007. That's one of the really nice things about our program - an outdoor wedding with scheduling flexibility - dare to dream. Too dreary to get married. Wednesday rolled around and we were both full of jitters. The one unstoppable thought in my mind was "What if someone is there fishing?" How many women are tough enough to get ready for their wedding in a 17ft camper with a hand mirror? One? We got down to the spot and my fears were pointless - we were alone. I went down to the creek and set up the camera. The moment Chloe stepped through the yellow flower covered bushes - emerging to marry me - was the single most beautiful moment I've known. Exchanging vows went smoothly. Not to miss all wedding traditions - Chloe choked up. 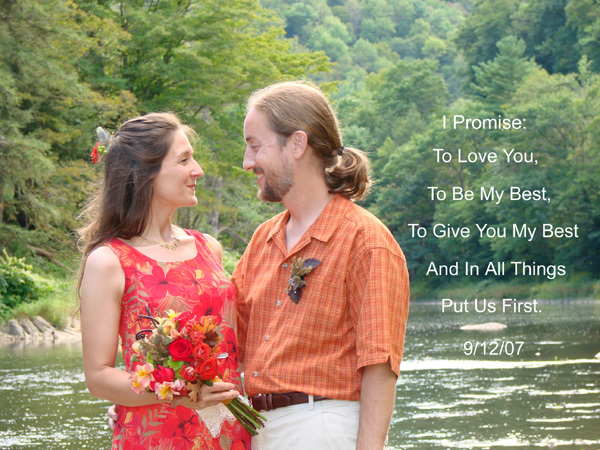 Our simple but whole vows. After wedding dinner. Even served a very fine vegetarian entree! What wedding is complete without cake?